Michigan (7-2) will take on Indiana (4-5) this week in Bloomington as the race for the Big Ten East has changed quickly amongst the top three teams. If the Wolverines win out (and Ohio State can do something good just one time in the history of the world), the Wolverines could be playing in Indy in a few weeks. I’m going to take my breakdown and prediction a new way this week, rather than breaking it down offensively/defensively between both teams, I’m just going to type away some thoughts on the game. This is what we call a “trap game,” it seems like it should be a breeze because it’s the Indiana Hossiers. The Hoosiers, I don’t believe they made a football movie named “Hoosiers” did they? No. However, the Hoosiers have looked pretty good so far this year despite losing five games. They started off hot, and won their first four games. They took Michigan State down the wire (although the score doesn’t quite show it) and they gave the Buckeyes a run for their money. This Indiana team is actually quite capable of winning any game in the Big Ten, even though they are 0-5 in the conference. Nate Sudfeld is a very capable quarterback for the Hoosiers, and can sling the ball all over the field. The problem is, his offensive line can’t consistently protect him, which plays right into Michigan’s hand as solid pass rushers. Jordan Howard took over for Tevin Coleman after he went to the Atlanta Falcons in the NFL Draft, and has had a solid season thus far, rushing for 961 yards and seven touchdowns. Devine Redding also has seven rushing touchdowns on the season, to go along with his 463 yards. The problem with Indiana is the fact they likely won’t be able to block Michigan’s defensive line and blitzing linebackers consistently all game. This will force Sudfeld to make throws, and ultimately make mistakes. The Michigan defense is going to need to force turnovers in the game to keep the mediocre Indiana defense on the field, and tire them out. The Wolverines have struggled on the road for some time now, but have been winning on the road under Harbaugh (aside from Utah, of course). The team will need to put any road struggles behind them these next two weeks and earn wins. 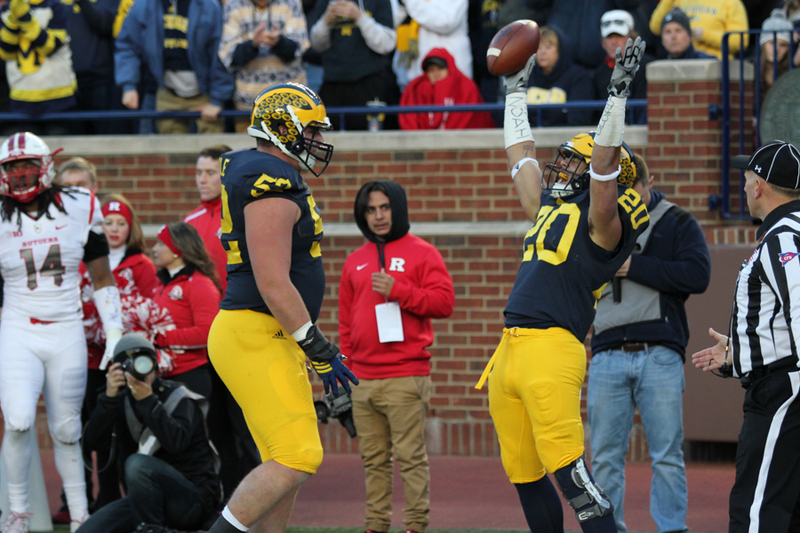 One thing Harbaugh and company are great at doing… Finding ways to win football games. The Wolverine offense is likely going to find ease in running the football. Tim Drevno has done wonders with the offensive line and each week they’ve just gotten better and better. I expect to see them push around the Hoosier defense and DeVeon Smith and Drake Johnson will run wild on the Hoosier defense. And what did we learn last week? Jake Rudock is more than capable of throwing the football around if needed. The biggest focus on this game that I will reiterate is the play of the Wolverine defense. Yes the defense is ranked number one in the country, but on the road in Minnesota they struggled and let Minnesota march down the field before ultimately stopping them. Harbaugh needs to rely on his defense to stop the Hoosiers, and put the ball back in the hands of the offense and Jake Rudock to control the game. If the Wolverine offense can control time of possession, they will have no issues controlling the football game and winning the first of back to back must-win road games.